I Need Truck Scale Prices & How Much Does a Truck Scale Cost? We typically get some version of these statements or questions just about every day. Rough estimate on average would be $40K-$65K when it’s all said and done. It could be a little less money and it certainly could be more money, depending on what you are looking to do. It’s hard to give an exact answer since every situation is a little different. Maybe you’re replacing an existing CMI truck scale. Or perhaps you’re looking to extend a 60′ Weigh-Tronix truck scale into a 70′ scale. Or perhaps you’re putting in a brand new B-Tek scale and will need the concrete foundation formed and poured as well. That is why it’s important to discuss your application with your scale sales person and determine what products and services will work best for your situation. What exactly are the main parts of a truck scale? There are several major components when you look at a truck scale. First, is the actual scale itself, also sometimes called the Weighbridge. This is the main surface for the trucks being weighed. Weighbridge lengths vary from around 20 foot to over 100 foot. Widths vary from around 10 foot to 14 foot but are usually 11 foot. Typical weighbridge platform tops are either steel or concrete. If you contact more than one scale company then you will probably find one talking down about the other brand. For example; Rice Lake versus Cardinal Scale Manufacturing. Or Mettler Toledo versus Avery Weigh-Tronix. All of the brands mentioned above are good brands. You will need to determine which manufacturer you prefer and also which local scale company you like the best and what features you want / need. When you talk about the Weighbridge, you will also probably be told about CLC ratings. Concentrated Load Capacity, or CLC, is an industry recognized rating of a vehicle or axle load scale. The rating defines the maximum load for which the weighbridge is designed as applied by a group of two axles with a center line spaced 4 feet apart and an axle width 8 feet apart. This is an area where you can save money in certain situations. If you will have limited amounts of daily traffic, then chances are you may not need a really high CLC rated Weighbridge. Be sure to discuss this with your scale sales person. You’ll also need to discuss the material, do you want steel deck or concrete weighbridge scales? Next major component to consider is the Digital Weight Indicator. This item is what displays your truck weight. We have several different truck scale indicator models to choose from. This is an important part of a truck scale. You’ll definitely want to choose a readout that has truck storage and serial ports for your ticket printer and remote display. Next important component are Load Cells. Most truck scales usually have around (8) cells inside. The 3 most common types of load cells are analog, digital, or hydraulic. Each has it’s own advantages. This is a subject you will definitely want to discuss with your scale sales person as this can raise or lower the up front cost but could have a big impact on the long term cost of ownership. The next important part of a truck scale is the Foundation, which is simply the concrete base which the load cells and weigh bridge rest on. These are normally above ground with approaches on each side. We also offer truck scales that sit in a pit. 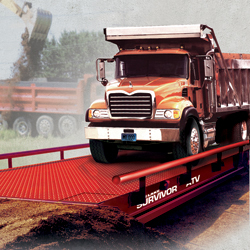 The final important component to consider when buying a truck scale is the Peripherals. These are items like truck management software, ticket printers, remote displays, traffic lights, intercoms, etc…. You need some of these items for sure. A few others might be good choices, depending on your particular situation. So as you can hopefully see, there really isn’t a one size fits all answer to the question, how much does a truck scale cost? If you’re in the market for a truck scale, and we sell some very nice models including the Rice Lake OTR, contact us (919) 776-7737 and we can get you a current price.